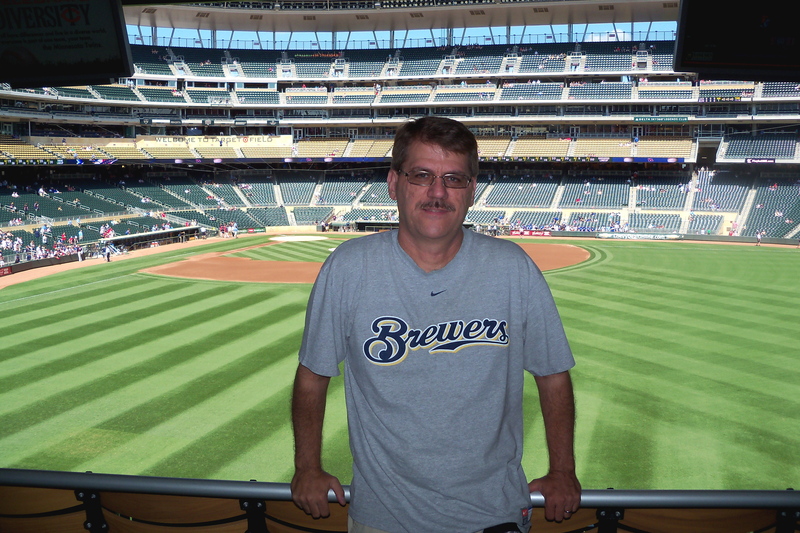 Last week I drove to Minneapolis to take in a baseball game between the Minnesota Twins and the Los Angeles Dodgers. I met my Las Vegas friend Steve Guiremand and his son, Kyle, at their hotel near the Mall of America, and we took the light rail to the stadium in downtown Minneapolis. The drive from Ames to Minneapolis is a little more than 200 miles. It took me slightly less than 3 1/2 hours. It’s a simple route. You get on U.S. 35 in Ames and take it all the way to Minneapolis. There’s not a whole lot to see along this route, other than green fields. Barn-themed rest stop in northern Iowa. Iowa has some amazing rest stops. In a previous post, I discussed one outside Iowa City dedicated to the writing art. 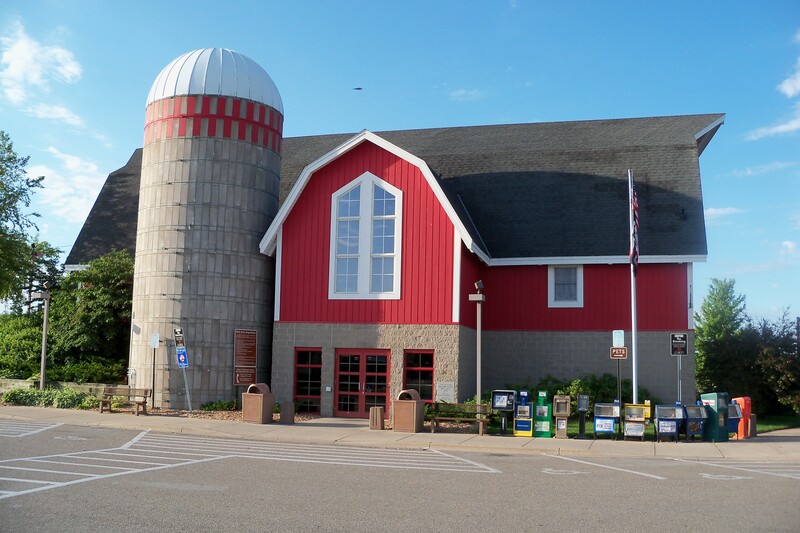 The one I stopped at en route to Minneapolis is a two-story structure in the form of a barn. Inside, there are numerous vending machines, and upstairs there’s a coffee shop. It was not open yet when I stopped there fairly early in the morning. 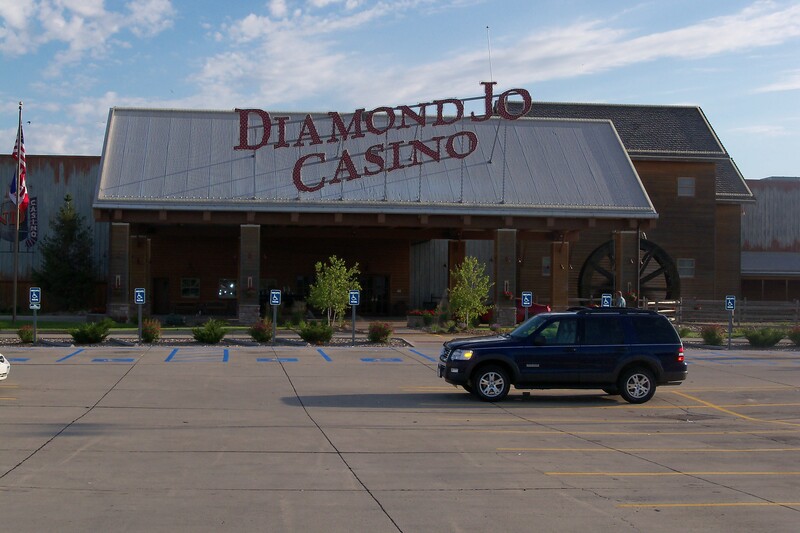 Across the way from the rest stop is another of Iowa’s casinos, the Diamond Jo. I didn’t go inside but thought I’d document its existence anyway for those who are curious about casinos outside the state of Nevada. 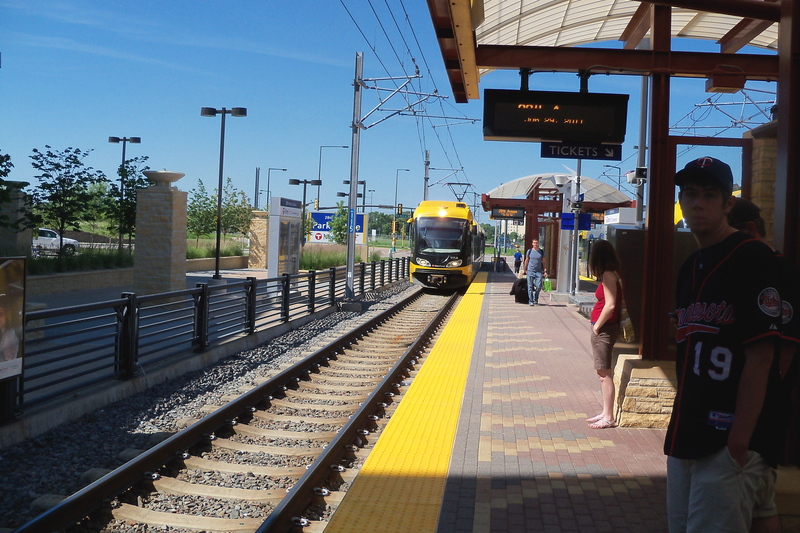 Minneapolis’ light rail is very nice and easy to use. It’s clear that it gets a lot of use. Las Vegas really ought to think harder about building one. 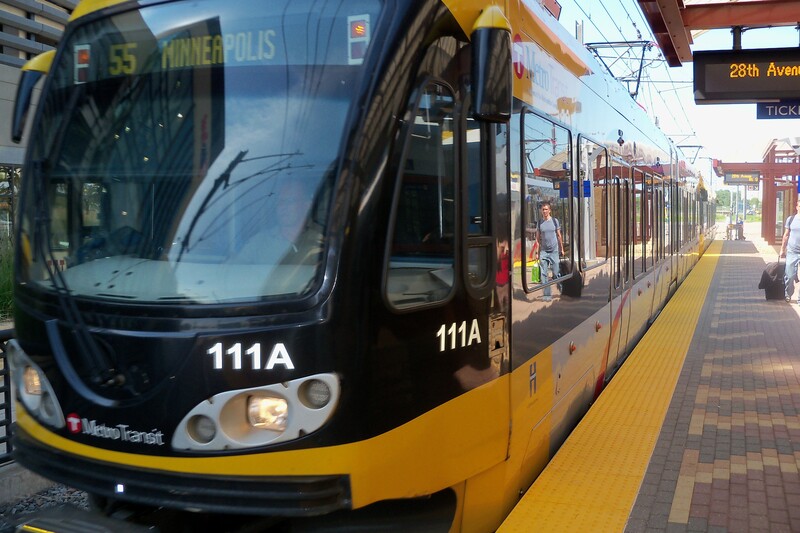 We joined literally hundreds of others who parked at or near the Mall of America, in a suburb of Minneapolis, and took the light rail to the game, thereby avoiding the hassles of navigating traffic in one of the nation’s largest metropolitan areas. It’s also not very expensive: We paid $4 for a roundtrip ticket. Target Field, just a little more than a year old, is a fine baseball stadium. It seems like there’s a great view from every seat, including ours. The food is good, and the prices are surprisingly decent. I had a brat, of course. I’m eager to see a few more major league stadiums in the Midwest. Light rail pulls into the station. After the game, which the Twins won 1-0, and a return trip on the light rail (packed with baseball fans), we checked out the Mall of America, or part of it anyway. I bought a hard-to-find style of baseball cap and T-shirt (Brewers) in a sports apparel store. Wandering over to the Barnes & Noble, wouldn’t you know it, but Sarah Palin was there doing a book signing. Hundreds of people were lined up, or snapping pictures from afar. I managed to squeeze through the hordes to get a decent photo. It wouldn’t have been decent if I didn’t have a great zoom capability on my point-and-shoot Kodak. Once the family arrives later this month, I could see us taking a trip to the Mall of America, which has every store on Earth, plus many other amenities, including a roller coaster. It’ll make for a long day, but it’s doable. 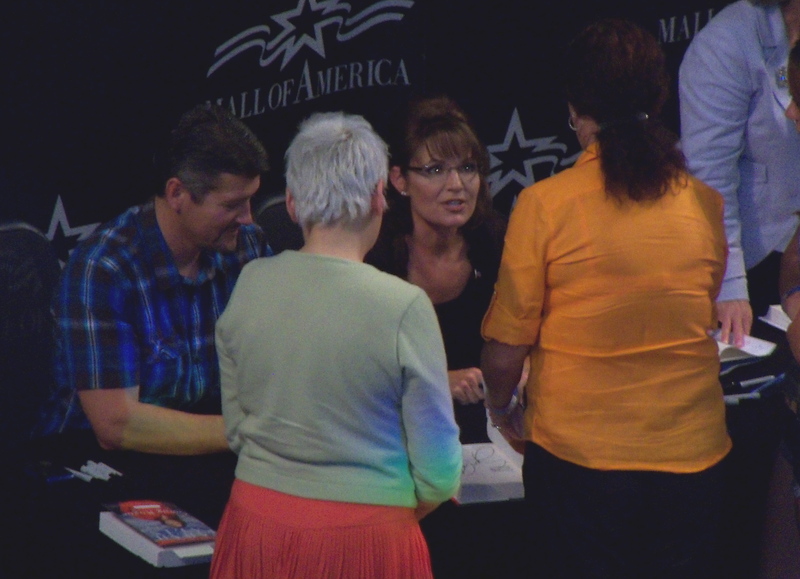 Sarah Palin, with husband by her side, greets fans and signs books at the Mall of America. Geoff – Target Field opened last March (2010), so it is just over a year old, not “several”. Mark: Thanks for the correction. I just fixed it in the post. Geoff, what a great report with super dooper details and fantastic photos. I was in Las Vegas this week recording the Home for the Friendless as an audio book, and the temps were as follows: 103, 105, 107, and finally 113. In spite of that I was cold all the time with the AC inside the buildings and homes turned down to arctic temps. I had to go outside to warm up. I think you’re turning into an Iowan. I like it.